At Ikom, in the North of Cross River State, there is a mysterious circle of stones known as the Ikom monoliths, right on the border with Cameroun. They have moved one to the grounds of the Calabar museum. The stones have been dated at 200AD, but may be older. About 3 feet high, the design on the front is extraordinarily beautiful. We must be thankful the British didn't find them in time to steal them away to the British Museum and keep them locked in some dingy basement. My tour guide tells me they have found similarities between one of the nearby local languages and the language spoken by the Ancient Egyptians.. One thing is sure, one of the main ethnic groups in the State, the Efik, migrated over 500 years ago from Sudan, so there may just be a link with Nilotic cultures.. 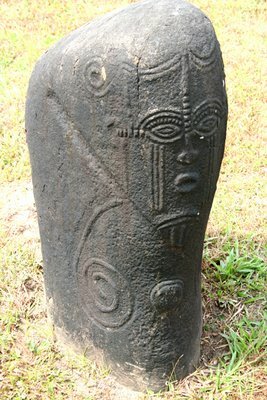 The Efik were also middlemen who profited hugely during the slave trade. The tourist guide laughed sheepishly when I asked her about this..